Drosophila stage 10 egg chamber. DNA (blue) labels large nuclei of nurse cells and smaller follicle cells. Fluorescent in situ probes to chromosome-2 (red) and the X-chromosome (green) show condensin II mediated dispersal of chromatid fibers in nurse cells as they compact and form chromosome territories. Julianna Bozler and colleagues show that condensin II can exert mechanical forces great enough to remodel and pull nuclear envelope membrane into intra-nuclear vesicle-like structures, see Bozler et al. Image courtesy of Huy Nguyen. 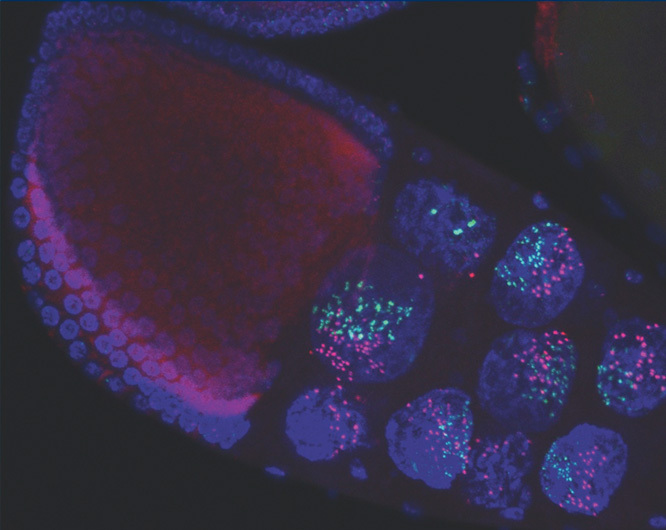 Just in time for the 2015 GSA Drosophila Research Conference, the new issue of G3 features FlyCatWalk for sorting live Drosophila based on morphometric traits, a Drosophila genome-wide association study for nutritional indices, and autosomal versus y-linked male determination in house flies. Check out the Table of Contents below!